An overflow crowd filled Derby’s Middle School on Jan. 12, 2019 to hear U.S. Sen. Chris Murphy discuss and answer questions about issues confronting the federal government. 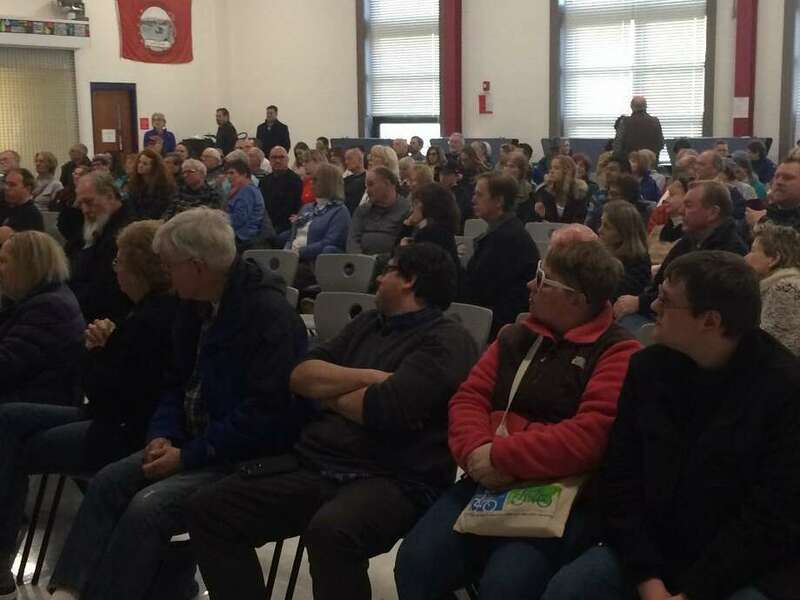 DERBY — The federal government shutdown, health care, global warming and school safety were among the many concerns U.S. Sen. Chris Murphy heard about during a town meeting Saturday at Derby Middle School. The Democratic senator from Connecticut spent nearly two hours talking to residents. Brooke Rondeau came from distant Bozrah in New London County, while others like Matt McGee and Stacy Stableford came from nearby Shelton and Trumbull. Two employees of the Federal Correctional Institution in Danbury urged Murphy to push legislation that would help them get paid during the shutdown. Pat Wynn, a union representative, said many workers are single parents living paycheck to paycheck, and those paychecks didn’t come Friday. “This is the longest government shutdown in the history of our country,” Murphy told the crowd. He said Congress passed legislation that will guarantee back pay to each of the 800,000 federal employees affected. Additional legislation which would prohibit creditors and credit rating agencies from taking action against these employees for failing to pay their bills on time is being worked on, Murphy said. He asked what happened to President Donald Trump’s campaign promise that Mexico would pay for the wall. The senator said he was hopeful “Senate Republicans would come around” and get the government open and its employees back to work. Murphy told the crowd, some of whom support Trump’s wall-building demands, that data he has seen shows the border-crossing counties “are the safest in the country.” He said rates of crimes committed by undocumented immigrants “are lower than” those committed by native-born Americans and more people on the terrorist watch list enter the country from Canadian than from Mexico. “The notion that the undocumented immigrants create a security risk is not held up by the data,” Murphy said. McGee, a 17-year-old Shelton resident, was one of several speakers who asked Murphy why he was not supporting an all-in Medicare health insurance plan. Murphy told the crowd he was in favor of offering choice — either a Medicare health care plan or private insurance. He also wants drug companies to be required to pay a portion of their profits into a pool for prescription abuse treatment. Jennifer Magri, president of Seymour’s Board of Education, and whose daughter teaches in Bridgeport, took issue with Murphy over legislation he proposed that protects students with disabilities from being secluded and restrained. Magri’s daughter had mailed Murphy a letter detailing an incident in her kindergarten class in which she was injured when a student began throwing things and becoming verbally abusive. “He blew me off, just like his staff blew my daughter off,” said Magri, adding Murphy neither addressed her concerns todayn or those of her daughter, who she said received a standardized email. Rondeau traveled from Bozrah to ask about climate change. Stableford, a Trumbull resident, told Murphy she needs “hope and optimism” amid being fed anger, conflict and resentment daily from television news. “Turn off cable TV for awhile,” Murphy suggested. While he commended investigative reporting, he said for many programs, “political news is entertainment, and entertainment is conflict ... There has been a litany of bipartisian bills passed” which he said got almost no mention on TV.